When Glenda Ewart was pregnant with her third child, high blood pressure meant she had to give up work. Four years later, what started out as a hobby has now grown into a business for the Castlerock mother-of-three. 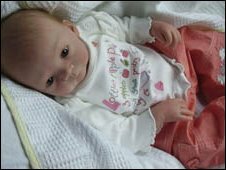 "When my midwife put me off work I was bored - one day I went online to look at baby clothes and I discovered reborns, I was amazed by them," she said. 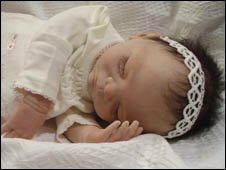 Reborns are life-size dolls created to look and feel like real newborn babies, even down to their weight. Although it might seem weird to some people, making and owning these life-like dolls is becoming increasingly popular. For the first year Glenda, 34, had her own son Leo to look after so she was happy to take her time and learn the basics. "The first couple I made weren't that great, but then I joined a guild and there are ladies there you learn from and I kept practicing." Each doll takes at least a month to make because of the intricate detail and design, and thousands of brush strokes are used to create and layer the colour of each doll to make them as life-like as possible. "If they want me to, I can work from a photograph and add special details. "Otherwise we start by agreeing on the basics, skin tone, colour of hair, birthmarks," she said. It can be a lengthy process, as non-fade paint is used and fingers and toes are sealed with a varnish to give a natural look. "The hair on each doll is hand rooted, using premium kid mohair so it can be gently wet and styled," she said. "It started out as just a hobby but now its a full-time job. "It has just grown and grown, ladies are buying them for their daughters or I make them for collectors." As a member of the Original Guild of Reborns, Glenda has the opportunity to sell all over the world. "The furthest away was Australia which was two years ago and I sent one to America just before Christmas."